The Reunion is Almost Here!!! It is like Christmas Eve in October; I can hardly contain myself. 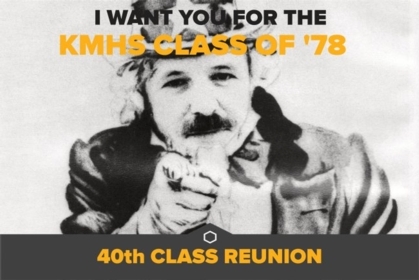 We are just one day away from the KMHS Class of '78 - 40th Reunion weekend! Can you believe it? Whoopeee! If you're like me, you are probably worried you won't remember a name or recognize someone. So, let's just get over that RIGHT NOW. You will not recognize someone... I admit it, I am the worlds worst at it. So what? We are all wearing name tags. Luckily we can all still read. For the Homecoming Parade, attend on your own. We tried to get a group together but there was not much interest. We can still cheer on Friday night. That will be a blast. The plan is to go to Cherokee Street Grill after the game. So those who can't make the game can still join us after. The Homecoming football game begins at 7:30 p.m. We have a block of seats for the Class of '78 and will be sitting together as a group. Just let the folks at the ticket booth know you are with our class. They'll point you in the right direction. Three other classes should be there that night for their reunions, too. The Rotary Club is doing their spaghetti supper in the high school cafeteria before the game. I don't know the exact time, but suspect they'll serve between 5 and 7 p.m. I think the cost of the meal is $9.00. Proceeds go to fund their scholarships, so it is for a good cause. If you go, you'll arrive early and get better parking than late arrivals. It is a way to get good parking and support the Rotary. Saturday morning, golfers will meet at the KMCC at 9 a.m. Let Jerry Jackson know you are coming. Mountaineer Days is in Patriot's Park and goes from 10 a.m. to 6 p.m. They'll have a ton of fun stuff to do, and are bringing back the beard contest and the Jail-A-Thon from the Centennial. Proceeds from that go to the KM Historical Museum. The KMHS Class of '78 - 40th Reunion! The venue address is Deer Woods Farm at 914 Ramseur Rd Bessemer City, NC 28016. Dinner is BBQ with all the fixings. The venue has a firepit out back, and we'll have corn hole. Dress for the event is casual. BYOB. We plan to spend time together as a class, celebrate, reconnect, and just have fun. We have the best class in the history of KMHS... by far. Let’s relax and celebrate us! The venue provides a DJ, and I requested 70's and 80's music, but you can make specific requests. We look forward to seeing all of you this weekend. If you can't make the reunion, attend the parade. If you can't make the parade, come to the football game. Or go with us in-between events and just hang-out. Spread the word and share the love. Or, come to every single Safe travels. We'll see ya'll soon. P-A-R-T-Y, Party hearty at KM High!